I'm currently reading a few books and one of them is Stephen LaBerge's Exploring The World of Lucid Dreaming. 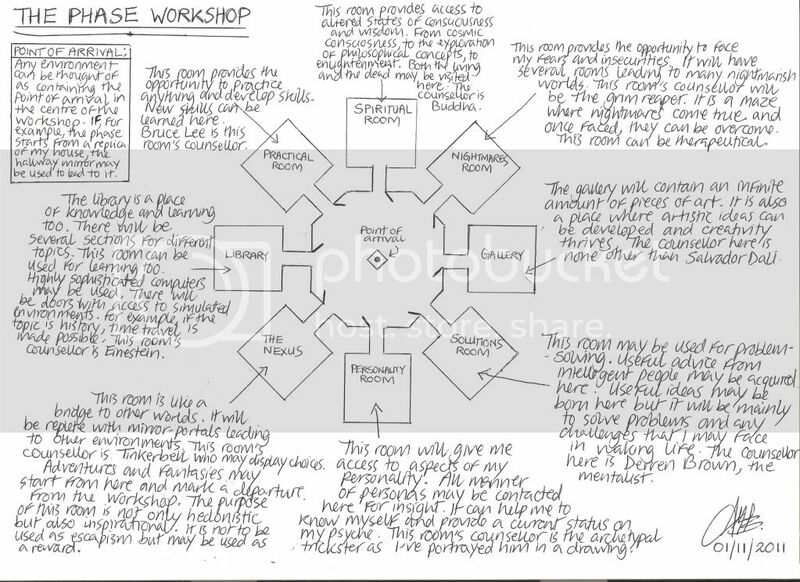 I found an exercise there whereby practitioners of the phase can create a workshop with useful tools and helpers (I prefer to call them counsellors). The more you visit this mind construct in the phase, the more you can improve it. You can always add to it! Notice how I've picked specific characters for each of the rooms. They are who I think represent each of the rooms best in my mind. You can also use the workshop to launch into your adventures. It could be your metaphysical base! Like a space station! Have fun! I a real life issue that needed dealing to and I put an advisory group together in a ld and in an indirect way got the answer I wanted. Interesting was that the group assembled in a room and as the members walked in they were old friends. Cool that my mind even gave me people I liked and trusted. Peter, that is great! There are a few stories like yours in Stephen LaBerge's book. It seems like you are very much your own friend and that is a good thing. You know you can always rely on that advisory group now! This is actually a fun idea Summerland. well, at least its something we can all agree with. I still haven't managed to do it, Snaggle. One definitely needs a lot of control and confidence! This is a great LD task. Interested to hear about other people's experiences with it. At the moment I've got this NDE simulation experiment to do for Michael Raduga, but afterwards, I will definitely dedicate myself to this. I really want to incorporate the workshop in my experiences. I see it like a space station with launch pads that can help me travel to many environments in the metaphysical universe. I definitely want to feel at home in this workshop. I'm aiming to make it as familiar as the home replicas feel when I have WILDs (using the "separation from the body" technique to enter the dream world lucidly).